Schizophrenia is a long-term (chronic) psychiatric disorder that severely affects a person's thinking, mood, and behavior. It is a leading cause of disability and a major risk factor for alcohol and substance abuse as well as suicide. The causes of schizophrenia are not known. Multiple factors such as genetics and brain chemistry may play a role. Schizophrenia can have a devastating impact on people and their families. People with schizophrenia have increased risk for self-destructive behaviors and suicide. The antipsychotic drugs used to treat schizophrenia can have severe side effects, including increased risk of obesity and diabetes. Typical antipsychotics ("first-generation" antipsychotics) include haloperidol (Haldol), chlorpromazine (Thorazine), perphenazine (Trilafon), thioridazine (Mellaril), trifluoperazine (Stelazine), and fluphenazine (Prolixin). All of these drugs are available as generics. Atypical antipsychotics ("second-generation" antipsychotics) include clozapine (Clozaril, generic), risperidone (Risperdal, generic), olanzapine (Zyprexa, generic), quetiapine (Seroquel, generic), ziprasidone (Geodon, generic), aripiprazole (Abilify), paliperidone (Invega), iloperidone (Fanapt), asenapine (Saphris), lurasidone (Latuda), and cariprazine (Vraylar). Schizophrenia is a long-term (chronic), severe brain disorder that interferes with thinking and mental or emotional responsiveness. The term schizophrenia, which means "split mind," was first used in 1911 by Swiss psychiatrist Eugen Bleuler to categorize people whose thought processes and emotional responses seemed disconnected. Despite its name, the condition does not cause a split personality. Schizophrenia is a lifelong condition that poses significant challenges to both people and their families. The severity and prognosis of the disease varies from person to person. With medication, therapy, and support services, many people are able to control their symptoms, prevent relapses, and cope well with their condition. Schizophrenia is one condition in a group of psychotic disorders characterized by disturbances in perception, behavior, and communication. Schizophrenia is part of a spectrum of psychotic disorders. Psychosis is the medical term for a loss of contact with reality. A delusion is a fixed, false belief. It can be bizarre (such as invisible aliens have entered the room through an electrical socket) or non-bizarre (such as unwarranted jealousy or the paranoid belief in being persecuted or watched). A hallucination is the experience of seeing, hearing, tasting, smelling, or feeling something that does not really exist. Auditory hallucinations are false senses of sound such as hearing voices that can't be heard by others. Auditory hallucinations are the most common psychotic symptom experienced by adults with schizophrenia. Visual hallucinations are often a symptom of childhood schizophrenia. Thought disorders are manifestations of disorganized speech and thinking. People with schizophrenia may have incoherent or garbled speech patterns ("word salad") or have difficulty expressing themselves in a logical manner. Extremely Disorganized or Abnormal Motor Behavior. Movement disorders can range from agitated or repetitive body movements to complete lack of motion or responsiveness (catatonia). A person may act with impulsive childlike silliness and be unable perform goal-directed behavior. Movements may be excessive and purposeless. They may also include staring, grimacing, and echoing of speech. Negative symptoms indicate an absence of normal emotional responses and interest in social interactions or typical activities, and an inability to experience pleasure. A prominent negative symptom associated with schizophrenia is emotional flatness ("lack of affect" or "flat affect"), which is often characterized by a lack of facial expression and expressive hand or body language, avoidance of eye contact, and speaking in a monotone. Avolition, another negative symptom found in schizophrenia, is a reduced ability to plan or initiate purposeful activities.
. Positive symptoms include the psychotic symptoms that are most often associated with schizophrenia. The American Psychiatric Association used to previously categorize subtypes of schizophrenia (such as paranoid and catatonic). The APA has eliminated these subtypes because they had not proven to be helpful or reliable for diagnosis or treatment decisions. The signs and symptoms of schizophrenia can start abruptly or emerge subtly. For many people, schizophrenia initially develops slow and gradually, and is often accompanied by symptoms of depression. As people with schizophrenia age, their psychotic symptoms often diminish over time. The causes of schizophrenia are not yet understood. Scientists think that schizophrenia may develop from a combination of brain chemistry, and genetic and environmental factors. Schizophrenia is associated with an unusual imbalance of neurotransmitters (chemicals that act as messengers between nerve cells). In particular, brain chemicals such as dopamine and glutamine may be involved. Magnetic resonance imaging (MRI) scans of the brains of people with schizophrenia have revealed structural abnormalities. Such problems may cause nerve damage and disconnections in the pathways that carry brain chemicals. Schizophrenia undoubtedly has a genetic component. The risk for inheriting schizophrenia ranges from about 10% for those who have one first-degree family member (mother, father, sister, or brother) with the disease to about 40% to 65% if the disease affects both parents or an identical twin. However, heredity does not explain all cases of schizophrenia. About 60% of people with schizophrenia have no close relatives with the illness. Researchers are seeking the specific genetic factors that may be responsible for schizophrenia. Genes under investigation include the neuregulin-1 gene, the OLIG2 gene, and the COMT gene. Researchers are also investigating how schizophrenia may be linked to abnormalities in genetic regions on specific chromosomes. There is increasing evidence that schizophrenia may share genetic pathways with other psychotic and psychiatric disorders, such as bipolar disorder and major depression. Schizophrenia is the most common psychotic condition, affecting about 1% of people worldwide. Schizophrenia can occur at any age. But it tends to first develop (or at least become evident) between adolescence and young adulthood, typically between the late teens and mid-30s. It rarely occurs before adolescence or after age 45. Schizophrenia affects both men and women. Men are more likely than women to develop schizophrenia at an earlier age and to experience more severe symptoms. For men, the age of peak onset is in the early-to-mid 20s. Women are most likely to develop schizophrenia when they are in their late 20s. Schizophrenia often runs in families. Factors that increase exposure to viruses (living in urban environments, large families, winter and spring births) have been associated with higher risk for schizophrenia. Maternal exposure to viruses like influenza or rubella, maternal malnutrition, preeclampsia, Rh incompatibility, and birth complications (such as a baby experiencing lack of oxygen during delivery) may be linked to schizophrenia. According to some studies, the older a father is when a child is born, the greater the risk is for schizophrenia in his offspring, perhaps because of a greater chance of genetic mutations in the sperm that can be passed on. An increased risk for schizophrenia is associated with living in the city compared to rural areas. The risk of schizophrenia is also higher in migrant populations and their children or second-generation migrants. Schizophrenia can have a devastating effect on both people and their families. Many people with schizophrenia abuse alcohol and drugs. Substance abuse, in addition to its other adverse effects, increases the likelihood that a person will not take medication and will have more severe symptoms. Although people with schizophrenia are not usually violent (except possibly those who have severe paranoia), substance abuse in people with schizophrenia increases the risk for violence. Nicotine dependence is the most common form of substance abuse among people with schizophrenia. Most people with schizophrenia smoke. Biologic and genetic factors associated with schizophrenia may play a role. For some people, smoking can be a form of self-medication that may help control symptoms. People with schizophrenia have an increased risk for suicide and suicidal behavior. Clinical depression is common among people with schizophrenia. The stresses of dealing with social isolation, discrimination, and stigma can also be factors. People with untreated schizophrenia are more likely to suffer from poverty, homelessness, and incarceration. If people do not take their medication and symptoms recur, they can have difficulty caring for themselves and be at risk for developing other medical illnesses. People with schizophrenia often do not seek routine medical care and health screenings, and have increased risk for dying from heart disease and cancer. Smoking, drinking, and other forms of substance abuse can also lead to medical problems (such as heart disease, cirrhosis, and malnutrition). In addition, the antipsychotic medications used to treat schizophrenia can cause weight gain, metabolic disorders, and heart problems. A strong social support system is very important for people with schizophrenia. In addition to medical professionals and community resources, family members play a vital role in monitoring a person's mental status and helping the person receive and maintain treatment. Schizophrenia produces enormous family stress. In addition to dealing with bewildering and frightening symptoms and personality changes, families often need to confront difficult bureaucratic obstacles in finding appropriate care for their loved ones. Support groups can help families realize they are not alone, and provide recommendations for resources and advocacy. There are no imaging or lab tests for diagnosing schizophrenia. A psychiatrist will make a diagnosis of schizophrenia based on a person's symptoms and how long they have lasted. 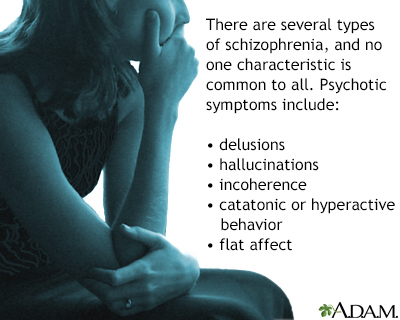 The diagnosis uses specific criteria defined by the American Psychiatric Association. At least two of the symptoms listed above are present during a 1-month period. At least one of the symptoms must be delusions, hallucinations, or disorganized speech. Signs of disturbance persist for at least 6 months. Major areas of functioning (work, school, interpersonal relations, and self-care) have been significantly affected since the disturbance began. Other disorders or conditions that may be confused with schizophrenia are ruled out. The common hallmarks of schizophrenia are also symptoms that can occur in dozens of other psychological and medical conditions, as well as with certain medications. Shared symptoms include delusions, hallucinations, disorganized and incoherent speech, a flat tone of voice, and bizarrely disorganized or catatonic behavior (such as lack of speech, muscular rigidity, and unresponsiveness). Bipolar disorder, schizoaffective disorder, and depression can have psychotic elements that resemble schizophrenia. The same is true for autism spectrum disorder and some communication disorders. Obsessive-compulsive disorder and body dysmorphic disorder have delusional elements similar to schizophrenia. People with post-traumatic stress disorder can experience flashbacks similar to hallucinations and have hypervigilance that verges on paranoia. Both substance abuse and withdrawal from drugs or alcohol can trigger psychosis. Other causes of psychotic symptoms include cancer and physical trauma to the central nervous system, infections such as encephalitis and syphilis, thyroid disorders, Alzheimer disease, epilepsy, Huntington disease, multiple sclerosis, stroke, Wilson disease, and some B vitamin deficiencies. Many medications may induce psychosis as a side effect, and some can trigger delusions and severe confusion. Such medication-induced symptoms are most often observed in older people. Medication is the primary treatment for schizophrenia, but therapies that address psychological and functioning needs are also important components. Research suggests that the earlier schizophrenia is diagnosed and treated, the better the outcome. There is strong evidence for the beneficial effects of early drug treatment in helping to control symptoms and avoid rehospitalization. Antipsychotic medications used for treating schizophrenia are generally categorized as either "typical antipsychotics" or "atypical antipsychotics." These drugs work in part by blocking receptors of the neurotransmitter (brain chemical) dopamine. Dopamine is thought to play a major role in psychotic symptoms. include haloperidol (Haldol), chlorpromazine (Thorazine), perphenazine (Trilafon), thioridazine (Mellaril), trifluoperazine (Stelazine), and fluphenazine (Prolixin). include clozapine (Clozaril, generic), risperidone (Risperdal, generic), olanzapine (Zyprexa, generic), quetiapine (Seroquel, generic), ziprasidone (Geodon, generic), aripiprazole (Abilify), paliperidone (Invega), iloperidone (Fanapt), asenapine (Saphris), lurasidone (Latuda), and cariprazine (Vraylar). Although these drugs have important benefits, they can also cause many side effects. Among the most disturbing side effects are those known as extrapyramidal symptoms, which involve the nerves and muscles controlling movement and coordination. Tardive dyskinesia is the most common extrapyramidal symptom associated with antipsychotic medications. It causes involuntary muscle movements that can be severe and even permanent. Movement disorders are more frequent with typical antipsychotics but they can also occur with atypical antipsychotics. Other serious side effects associated more with atypical antipsychotics are weight gain and metabolic changes, which can increase the risk for developing diabetes, high cholesterol levels, and heart problems. There are many other antipsychotic side effects that people (and parents) need to be aware of, especially for children and adolescents. Specific concerns for pediatric people in addition to weight gain and diabetes include increased prolactin levels, which can result in milk secretion from breasts (galactorrhea) and development of male breasts (gynecomastia). Not all antipsychotic medications are approved for children and adolescents. Doctors have debated whether newer atypical antipsychotics carry a treatment advantage over the older typical antipsychotics, which are much less expensive. Large, high-quality studies that have compared newer and older drugs have generally found that newer atypical antipsychotics are not any more effective than older typical antipsychotics for controlling symptoms of psychosis such as hallucinations, delusions, and agitation. Side effect profiles between typical and atypical antipsychotics are different. Both drug classes can cause movement disorders such as tardive dyskinesia, but the newer atypical second-generation drugs do not seem to cause them as often as the older typical first-generation drugs. However, the atypical antipsychotics pose a higher risk for weight gain and metabolic problems, which can lead to diabetes as well as heart disease. As mentioned above, there are additional concerns when treating children and adolescents. Do not prescribe antipsychotics to people without appropriate initial evaluation and appropriate ongoing monitoring. This includes evaluating for side effects and making sure that regular tests are performed for weight, waist circumference, heart rate, blood sugar levels, and cholesterol levels. Do not routinely prescribe two or more antipsychotic medications at the same time. Taking multiple antipsychotic medications increases the risk for side effects, drug interactions, and medication errors. For the severe, active phase of schizophrenia, people are often hospitalized. Injections of an antipsychotic drug are usually given every few hours until the person is calm. Anti-anxiety drugs may also be administered at the same time. In people who are being treated for the first time, improvement in psychotic symptoms usually becomes evident within the first few weeks of treatment, although the full benefit of the drug usually manifests over several more weeks and months. .
Once a person has recovered from a psychotic episode, the psychiatrist will adjust the medication to continue to keep symptoms under control. This is referred to as maintenance treatment. Most people with schizophrenia need to continue to take medication on a lifelong basis. People who stop medication usually experience relapse of psychotic symptoms and often require rehospitalization. The choice of an antipsychotic medication needs to be individually determined, and depends on many factors including a person's overall health condition and response to side effects. Side effects and effectiveness vary from individual to individual. Some trial and error adjustments may be necessary when prescribing dosage amounts so that the benefits of treatment outweigh the side effects of the therapy. The doctor must monitor the drug effects carefully including regularly checking a person's blood sugar (glucose) and cholesterol levels, as well as measuring any weight gain or changes in blood pressure or heart rate. If a single antipsychotic medication does not work, the doctor may prescribe a second one. Due to increased risk of side effects and drug interactions, the American Psychiatric Association does not recommend that people use more than two antipsychotic medications at one time. A psychiatrist may also prescribe other types of medication, such as antidepressants or antianxiety drugs, if necessary. Typical antipsychotics, also called first-generation antipsychotics, which are older medications, first approved in the 1950s. Atypical antipsychotics, also called second-generation antipsychotics, which are newer and tend to be more commonly prescribed. Large-scale studies have not found much difference between these classes of drugs when it comes to controlling psychotic symptoms. But there are some differences between typical and atypical antipsychotics in terms of side effects. Specific side effects vary from drug to drug, and an individual person's reaction to a drug. High-potency typical antipsychotics tend to cause more problems with extrapyramidal symptoms and increased prolactin levels than low-potency drugs. Low-potency typical antipsychotics tend to cause more side effects like dry mouth, sedation, sexual dysfunction, and drop in blood pressure when standing (postural hypotension). Clozapine was the first atypical drug approved (in 1989), and cariprazine the most recently approved (in 2015). Clozapine and olanzapine appear to have more side effects than the other atypical antipsychotics, particularly in terms of causing weight gain, insulin resistance, and unhealthy cholesterol levels. Clozapine can also cause agranulocytosis, a dangerous drop in white blood cell count. For this reason, many doctors recommend against using clozapine or olanzapine as first-line drugs. However, clozapine may have specific benefits for controlling positive symptoms, as well as violent, hostile, or suicidal behaviors. Extrapyramidal side effects (see below). These movement disorders can occur with any antipsychotic but are most common with certain typical antipsychotics as well as the atypical antipsychotic risperidone. The risk for type 2 diabetes is highest with the atypical antipsychotics clozapine and olanzapine. However, all atypical antipsychotics can significantly increase the risk for type 2 diabetes in children and adolescents. Weight gain and metabolic problems. The risk appears to be highest for olanzapine and clozapine, but is also generally high for all atypical antipsychotics and some typical antipsychotics. Particularly with olanzapine, clozapine, and quetiapine, increased risk for unhealthy triglyceride and cholesterol levels. Prolactin is a hormone manufactured in the pituitary gland. Abnormally high levels can cause menstrual problems and abnormal production of breast milk (galactorrhea) in non-breastfeeding girls and women, as well as in males. In boys and men, hyperprolactinemia is also associated with infertility, erectile dysfunction, and enlarged breasts (gynecomastia). , including increased risk for strokes and sudden death, especially with atypical antipsychotics. upon standing (orthostatic hypotension) caused by sudden drop in blood pressure. , a rare but life-threatening condition marked by high fever, stiff muscles, confusion, and changes in pulse, heart rate, and blood pressure. have occurred with asenapine (Saphris). People with an established diagnosis of diabetes who begin atypical antipsychotic treatment should be regularly monitored for worsening of blood sugar control. People with risk factors for diabetes (obesity, family history of diabetes) should undergo fasting blood sugar testing at the beginning of atypical antipsychotic treatment and periodically during treatment. All people treated with atypical antipsychotics should be monitored for high blood sugar (hyperglycemia) symptoms. People who develop hyperglycemia symptoms should undergo fasting blood sugar testing. There may also be an increased background risk of diabetes in people with schizophrenia. As a precaution, many doctors advise that all people treated with atypical antipsychotics receive a baseline blood sugar level reading and be monitored for any increases in blood sugar levels during drug treatment. People should also have their cholesterol and other lipid levels monitored. In addition to diabetes, atypical antipsychotics are associated with increased risk for heart problems. is the most common extrapyramidal side effect associated with antipsychotic medication. It typically involves repetitive and involuntary movements, or tics, most often of the face, which can include the mouth, tongue, lips, and jaw. Sometime the legs, arms, fingers, toes, or hips are affected. Symptoms range from mild to severe, and sometimes interfere with eating and walking. They may appear months or even years after taking the drugs. After the drug is stopped, symptoms can sometimes persist for weeks or months and may even be permanent. typically develops shortly after taking an antipsychotic drug. (Tardive dystonia develops later.) This syndrome includes abnormal muscle spasms, particularly sustained contortions of the neck, jaw, torso, and eye muscles. Other effects are agitation, slow speech, tremor, and retarded movement. Sometimes these symptoms mimic schizophrenia itself. Nearly every antipsychotic drug used to treat schizophrenia can cause extrapyramidal side effects to some degree. The risk seems to be higher with typical antipsychotics than atypical antipsychotics, but these side effects can also occur with the newer drugs. Prevention is the best treatment for tardive dyskinesia and other extrapyramidal side effects. Health care providers recommend prevention because extrapyramidal side effects are extremely difficult to treat once they occur. It is very important that people report to their providers any emerging signs of these symptoms. In their early stages, extrapyramidal side effects can often be reversed or stopped by reducing a medication's dosage. If switching to a different medication is considered, the doctor must be careful to monitor for worsening of psychosis. Switching to a different medication can also sometimes worsen extrapyramidal side effects instead of improve them. Once symptoms become severe, they become much more difficult to treat. There is insufficient evidence to recommend a standard treatment for extrapyramidal side effects. There is moderate evidence to support effectiveness the benzodiazepine anti-anxiety drugs clonazepam (Klonopin, generic) and lorazepam (Ativan, generic). There is weak evidence to support drugs used to treat other movement disorders, such as tetrabenazine (Xenazine), which is used to treat Huntington's chorea, and amantadine (Symadine, generic), which is used to treat Parkinson disease. Researchers are studying other types of treatments, such as deep brain stimulation. Beta blockers such as propranolol are also used. Anti-depressants such as selective serotonin reuptake inhibitors (SSRIs) or selective norepinephrine reuptake inhibitors (SNRIs) may be added to anti-psychotic therapy sometimes in what is called adjunctive or augmentation therapy. Antidepressants may help with depressive or negative symptoms in people who are not at risk for psychosis worsening. Psychological, psychosocial, and rehabilitative support can help people achieve skills to function better at home and in the community. While talking to a therapist may not be a substitute for antipsychotic medication, psychotherapy is an important part of an integrated treatment approach for schizophrenia. Psychotherapy can offer people an opportunity to discuss their feelings about living with schizophrenia, and ways that they can emotionally cope better with the condition. The use of cognitive-behavioral therapy is showing particular promise for improving symptoms of schizophrenia, such as delusions and hallucinations. This approach helps strengthen the person's capacity for normal thinking, using mental exercises and self-observation. People with schizophrenia are taught to critically analyze and develop techniques for dealing with specific symptoms, such as hearing voices. Psychosocial therapies can also be helpful for addressing alcohol and substance abuse, smoking, and weight gain. They can help with initial diagnosis and ruling out other causes of psychotic symptoms, as often they are more reliable sources of information than people themselves. They can encourage people to comply with drug treatments and to recognize early signs of serious treatment side effects. They can learn to recognize impending symptoms of relapse and help the person avoid situations that might trigger them. They can help the person maintain a healthy lifestyle, including getting enough sleep and avoiding substance abuse. They can guide the person to the right support services. Support groups can provide valuable shared advice, resources, and a sense of community, comfort, and advocacy for people and their families. Support groups can help people and families become better educated about schizophrenia, and learn more about the illness so they can better manage it. American Psychiatric Association website. Choosing wisely: antipsychotic medications. www.psychiatry.org/psychiatrists/practice/quality-improvement/choosing-wisely. Updated April 22, 2015. Accessed March 21, 2018. Bhidayasiri R, Fahn S, Weiner WJ, et al. Evidence-based guideline: treatment of tardive syndromes: report of the Guideline Development Subcommittee of the American Academy of Neurology. Neurology. 2013;81(5):463-469. PMID: 23897874 www.ncbi.nlm.nih.gov/pubmed/23897874. Bhidayasiri R, Jitkritsadakul O, Friedman JH, Fahn S. Updating the recommendations for treatment of tardive syndromes: A systematic review of new evidence and practical treatment algorithm. J Neurol Sci. 2018;389:67-75. PMID: 29454493 www.ncbi.nlm.nih.gov/pubmed/29454493. Bobo WV, Cooper WO, Stein CM, et al. Antipsychotics and the risk of type 2 diabetes mellitus in children and youth. JAMA Psychiatry. 2013;70(10):1067-1075. PMID: 23965896 www.ncbi.nlm.nih.gov/pubmed/23965896. Hatta K, Sugiyama N, Ito H. Switching and augmentation strategies for antipsychotic medications in acute-phase schizophrenia: latest evidence and place in therapy. Ther Adv Psychopharmacol. 2018;8(6):173-183. PMID: 29854396 www.ncbi.nlm.nih.gov/pubmed/29854396. Hay A, Byers A, Sereno M, Basra MK, Dutta S. Asenapine versus placebo for schizophrenia. Cochrane Database Syst Rev. 2015;(11):CD011458. PMID: 26599405 www.ncbi.nlm.nih.gov/pubmed/26599405. Leucht S, Cipriani A, Spineli L, et al. Comparative efficacy and tolerability of 15 antipsychotic drugs in schizophrenia: a multiple-treatments meta-analysis. Lancet. 2013;382(9896):951-962. PMID: 23810019 www.ncbi.nlm.nih.gov/pubmed/23810019. Leucht S, Leucht C, Huhn M, et al. Sixty years of placebo-controlled antipsychotic drug trials in acute schizophrenia: systematic review, bayesian meta-analysis, and meta-regression of efficacy predictors. Am J Psychiatry. 2017;174(10):927-942. PMID: 28541090 www.ncbi.nlm.nih.gov/pubmed/28541090. Matthews PRL, Horder J, Pearce M. Selective noradrenaline reuptake inhibitors for schizophrenia. Cochrane Database Syst Rev. 2018;1:CD010219. PMID: 29368813 www.ncbi.nlm.nih.gov/pubmed/29368813. McClellan J, Stock S; American Academy of Child and Adolescent Psychiatry (AACAP) Committee on Quality Issues (CQI). Practice parameter for the assessment and treatment of children and adolescents with schizophrenia. J Am Acad Child Adolesc Psychiatry. 2013;52(9):976-990. PMID: 23972700 www.ncbi.nlm.nih.gov/pubmed/23972700. McDonagh MS, Dana T, Selph S, et al. Treatments for schizophrenia in adults: a systematic review [internet]. Rockville (MD): Agency for Healthcare Research and Quality (US). AHRQComparative Effectiveness Reviews. 2017; Report No. : 17(18)-EHC031-EF. PMID: 29537779 www.ncbi.nlm.nih.gov/pubmed/29537779. Naeem F, Farooq S, Kingdon D. Cognitive behavioural therapy (brief versus standard duration) for schizophrenia. Cochrane Database Syst Rev. 2015;(10):CD010646. PMID: 26488686 www.ncbi.nlm.nih.gov/pubmed/26488686. Ortiz-Orendain J, Castiello-de Obeso S, Colunga-Lozano LE, Hu Y, Maayan N, Adams CE. Antipsychotic combinations for schizophrenia. Cochrane Database Syst Rev. 2017;6:CD009005. PMID: 28658515 www.ncbi.nlm.nih.gov/pubmed/28658515. Pillay J, Boylan K, Carrey N, et al. First- and second-generation antipsychotics in children and young adults: systematic review update [internet]. Rockville (MD): Agency for Healthcare Research and Quality (US). AHRQ Comparative Effectiveness Reviews. 2017; Report No. : 17-EHC001-EF. PMID: 28749632 www.ncbi.nlm.nih.gov/pubmed/28749632. Raviola GJ, Trieu ML, DeMaso DR, Walter HJ. Childhood psychoses. In: Kliegman RM, Stanton BF, St. Geme JW, Schor NF, eds. Nelson Textbook of Pediatrics. 20th ed. Philadelphia, PA: Elsevier; 2016:chap 31. Zhuo C, Tao R, Jiang R, Lin X, Shao M. Cancer mortality in patients with schizophrenia: systematic review and meta-analysis. Br J Psychiatry. 2017;211(1):7-13. PMID: 28596246 www.ncbi.nlm.nih.gov/pubmed/28596246.